The bootloader: a small program on the ARM processor’s chip designed to initialize the fundamental hardware subsystems and bootstrap an operating system or a runtime such as the .Net Micro Framework. The .Net Micro Framework: is composed of a set of binary files making up the Common Language Runtime, the engine capable of running compiled .Net applications written in languages such as C# or VB.Net. Every once in a while, SecretLabs makes changes to the Netduino port of the .Net Micro Framework which also requires flashing the bootloader first. 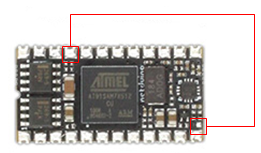 Atmel provides a tool called the ‘SAM Boot Assistant’ (SAM-BA) which is designed for tasks such as flashing bootloaders on their chips. For the Netduino mini, we’re going to need the version of SAM-BA designed to work over a RS232 serial interface which you can download and install from the Microship site here. Before running SAM-BA to flash a bootloader, you need to erase the Netduino’s flash by connecting PIN 21 (5 volts) to the tiny gold pad near PIN 12 for a couple seconds. Once that’s done, start SAM-BA v2.9. A small dialog box will prompt you for a connection and a board. For the connection, select the same COM port configured for the debugger / VC# deployments in Appendix D.
For the board, select “at91sam7x512-ek”. Click “Send File”. A dialog with an hourglass will appear while the file is being uploaded to the netduino’s flash. We’re done with SAM-BA, so close it. Turn off the Pix-6T4 console, wait a couple seconds, then turn it back on. The next step in the process is to flash the Netduino mini with a fresh copy of the .Net Micro Framework which is located under the folder named “tinyclr.hex” we downloaded earlier. 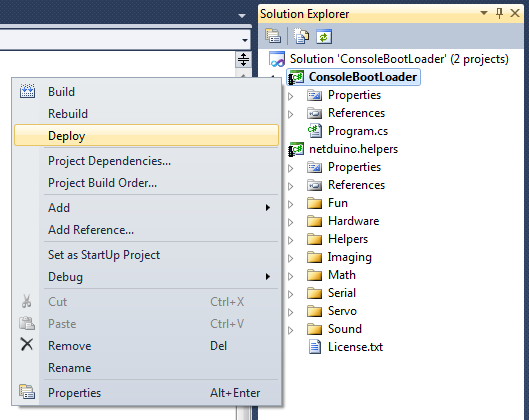 In the “Device” section, select “Serial” and the COM port assigned to the debugger / VC# deployments. 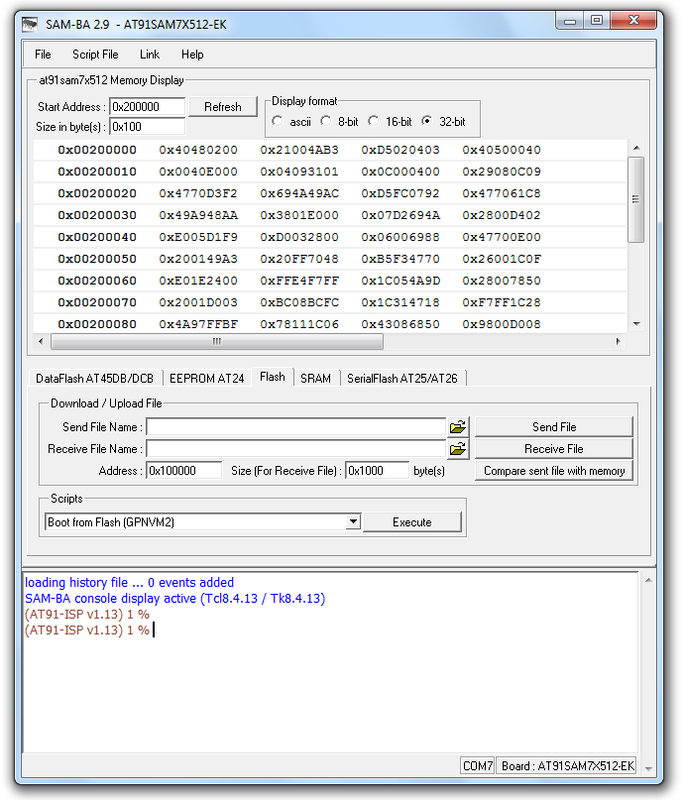 In the “Image File” section, click “Browse” and navigate to the folder where you downloaded the firmware earlier (“D:\netduino mini\tinyclr.hex” in this example). 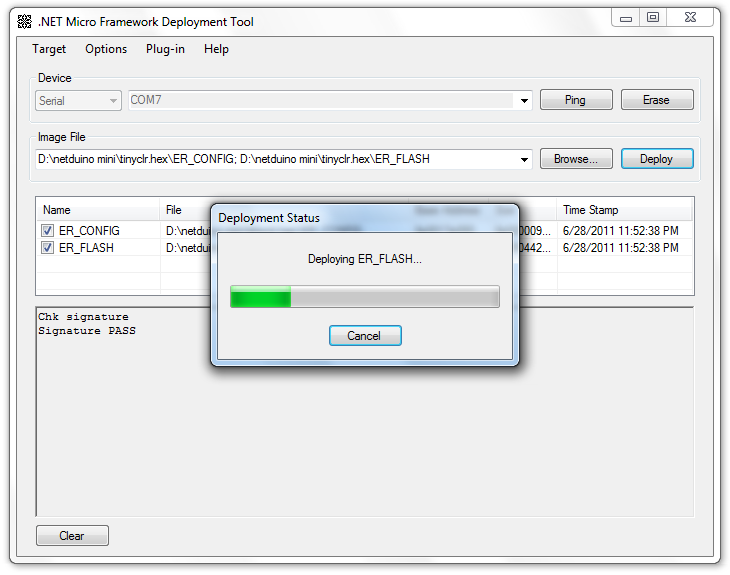 Select both of these files: "ER_CONFIG" and "ER_FLASH"
We are done with MFDeploy, so close it. This final step will restore the Pix-6T4 console to its original state by re-installing the bootloader application allowing the console to load and start games. Once in VC#, ensure that the project properties are configured properly to deploy serially over the proper COM port. VC# will recompile the project and will deploy it to the Netduino mini. Turn off the console, then turn it back on with an SD card containing game cartridges in it. If all is well, it should boot to the game selection menu.